Latitude: 25.344683. Longitude: 130.037370. Ayres Rock is a ‘world famous’ natural rock formation (which includes Kata Tjuta) in the Australian outback – the southern part of the Northern Territory, central Australia, some 208 miles (in a straight line) south of Alice Springs, by road it is more like 280 miles! This sacred sandstone rock is located close to State Route highway 4 (Lesseter Highway) but more often called Uluru Road, a few miles south-east of Yulara. 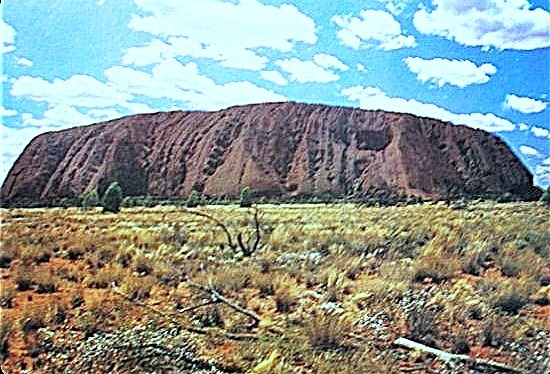 The Aboriginal people of Australia regard Ayres rock, also called Uluru, as a sacred place. There are many deep springs and watering holes (billabongs) located on and around the rock that are known to have sacred healing qualities, and there are caves with rock-art. Ayres Rock Campground and Uluru-Kata Tjuta Cultural Centre at Yulara are in a rocky area to the north, spread out over several miles, just east of State Route 4 in The Kata Tjuta National Park. Ayres Rock is now a World Heritage Site. The 19th century explorer Sir William Gosse named the great rock after Sir Henry Ayres, premier of South Australia. At an elevation of 2,830 feet, 860 metres above sea level, a height of 1,142 feet (348 metres) and a length of 3.6 km (2.2 miles) Ayres Rock monolith is a massive natural rock formation that can be seen a very long way away, sixty miles or more due to the terrain of the Northern Territory. It is ‘said’ to be upto 450 million years old, with a circumference of 9.4km (over 5 miles) and estimated to be 6kms below ground level. The make-up of the rock, geologically speaking, is very interesting in that it is made of reddish ‘arkose’ sandstone, although seperately Kata (the Olgas) is a conglomerate mix of small stones and boulders fused together with mud etc. Uluru is distinctly reddish at certain times of the day due to the high iron, red oxide content of the rock, but at other times it is grey. The rock also has a rich feldspar content whic adds to the rock’s distinctly reddish hue, although the colours change at different times of the day. Over millions of years there has been much erosion due to weathering and it is ‘this’ that has caused the strange formations of gulleys, ridges and furrows that we see today. The rock is virtually bare with no vegitation whatsoever. Categories: Natural Rock Formation, Rock Art | Tags: Ayres Rock in central Australia, Ayres Rock in the Northern Territory of Australia | Permalink.